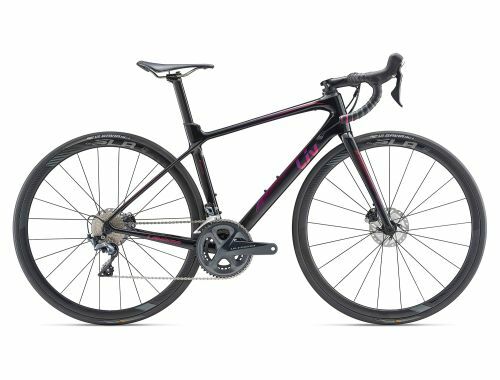 The compact Advanced Composite frame, slender tubing, and stiffness tuned for the female rider is a serious climbing weapon. Combining innovative tubing design with the Flux stem to slice through the wind without sacrificing weight or stiffness. This climbing weapon can tackle the return descents or any technical flat corner, with appropriate lateral stiffness and disc brake control. Langma Advanced Pro Disc is handcrafted for the toughest climbers, aspiring racers, seasoned competitors and passionate cyclists alike, and is the secret weapon for charging the breakaway. Langma Advanced Pro Disc is built to fly up steep grades and long climbs, and is fit for endless switchbacks. The slender tubing and light weight combine for quick accelerations so you can conquer the climbs, power through flats, rail technical descents, and attack the group! This bike is a true companion for a determined rider. Langma's frame geometry is designed from the ground up to help women achieve the highest level of performance, while no-compromise components and women's-specific contact points ensure comfort where women need it most. With compact frame geometry, Langma is lighter, stiffer and smoother with a better fit and precise handling. Oversized headset bearings (1 1/4-inch top and 1 1/2-inch bottom bearings) offer unprecedented steering performance, stiffness, and control. A lightweight Advanced Composite frame is hand-crafted in-house to provide optimally tuned stiffness and compliance for female riders. Langma features aero elements, like an aerodynamic downtube that thickens as it nears the bottom bracket for optimized aero features and pedaling stiffness. Equipped with front and rear thru-axles and flat mount disc brake integration for superior control and aesthetics. Availability varies by country. A massively oversized bottom bracket/chainstay area features a fully integrated, 86-millimeter wide bottom bracket design (92-millimeter-wide for off-road bikes). Asymmetric chainstays provide additional stiffness on the drive side and stability on the non-drive side. This proprietary seat post design optimizes the balance between a lightweight and superior ride quality, with simple adjustment to enhance the total race performance of the Langma road range. Liv and Giant’s chainstay-integrated, wireless data transmitter. The removable transmitter sends wheel speed and cadence information directly to any ANT+ compatible computer. Giant SLR Wheels come stock with SLR Tubeless tires to improve overall performance, ride quality and durability. The most advanced steerer tube technology in today’s Liv and Giant bikes. Designed to offer unprecedented front-end steering performance, the system’s oversized headset bearings (1 1/2” lower, 1 1/4” upper) and tapered steerer tube work in harmony to provide supreme steering stiffness.